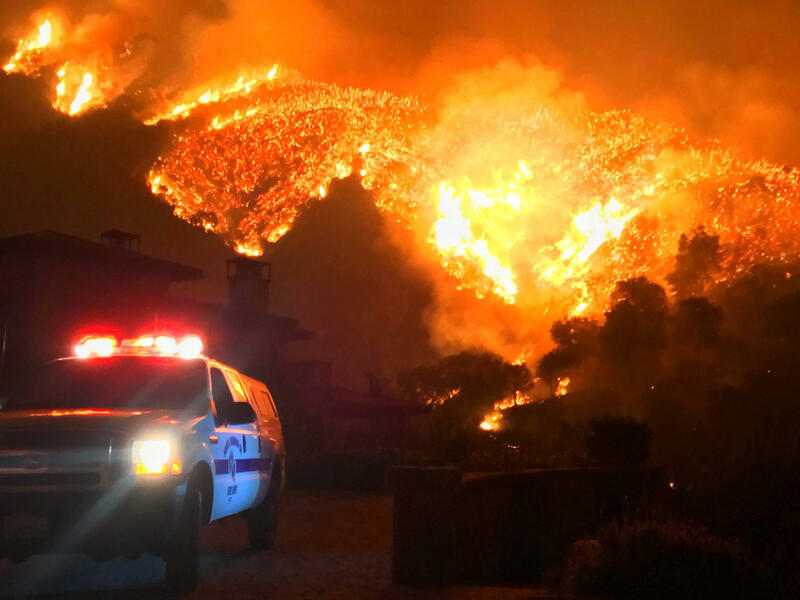 SANTA BARBARA, Calif. -- A firefighter died Thursday while working a colossal wildfire burning in coastal mountains northwest of Los Angeles that has become the fourth largest in California history. CBS Los Angeles reports the victim was a Cal Fire engineer who worked for the department's San Diego unit. The death, but no details of the circumstances, was confirmed in a statement from Chief Ken Pimlott of the California Department of Forestry and Fire Protection. A news conference is scheduled for 6 p.m. PT in San Diego. "The incident is still unfolding, but in this world of fast moving information it is important to me that only actual information be shared," he said. Police said his family had been notified. The 242,500-acre Thomas fire, burning in Ventura and Santa Barbara counties, was 30 percent contained as of Thursday morning. With the fire flaring up, Ventura County sheriff's deputies reiterated that mandatory evacuation orders were in place for several areas in Fillmore. The blaze has burned more than 379 square miles since it erupted on Dec. 4. It has destroyed 972 buildings, including at least 700 homes, and damaged 221 others. Flames have threatened 18,000 buildings, which prompted evacuations of about 100,000 people. The Thomas fire is the fifth-largest wildfire in California history. It continues to spread mostly into national forest land. A red flag warning remains in effect through at least 10 a.m. Friday. The National Weather Service says extreme fire danger conditions could last through the weekend due to lack of moisture and an increase of wind speeds.